Sunday overnight price action started with some optimism on the board, but that gave way to commercial selling as the night wore on. We find prices on the CBOT where we left them on Friday, with July corn hovering over 370 for what feels like infinity now, Wheat trading on both sides of 430 in KC and Chicago and Soybeans are unchanged near 925 November. December cotton is down below 73 cents again. The US dollar index is close to unchanged while the Real is up almost 1% vs the USD, which should help support. The week ahead is book ended with crop progress numbers released this afternoon and the WASDE on Friday. The former is probably more important given the change in weather patterns and the wonky start to the growing season. This afternoon we will get out second look at corn conditions and our first look at cotton and soybean conditions. I expect corn conditions to be unchanged cotton and soybean conditions to begin the year at or above 5 year averages. June WASDE is typically a slow report given the lack of yield and acreage revisions. 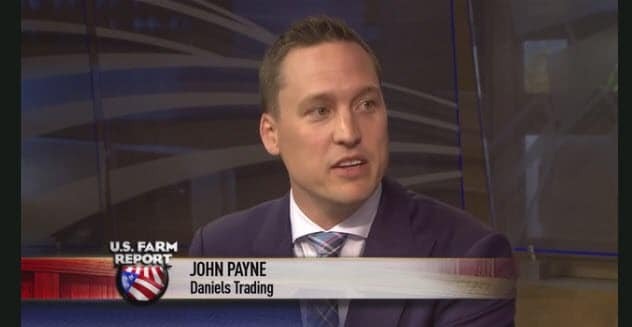 I do not look for markets to move from a perceived S/D change until after the June 30th acreage/grain stocks report. The weather may be the biggest factor this week given the sudden shock of heat observed across the central and western growing regions. The extended weather models continue to have their problems with the new warmer/drier US weather pattern and they are having lots of trouble sorting out the details. A large part of the N Plains and the Midwest see little or no rainfall for at least the next week, given the the temperatures the markets could begin to price this in. Wheat certainly has, with Minneapolis wheat futures trading near 1 year highs into the close on Friday. The COT report from Friday showed little in the way of net change for the markets we follow. The stories remain the same: corn and wheat trade just off their record short positions, as do soybeans but that has been recent while corn and wheat have been there for a while. Cotton is the opposite, with a near record net long position, albeit smaller than in recent weeks. One thing I have noticed is a growing standoff between longs and shorts in the corn market. The net position has not changed but the number of specs on each side is growing. 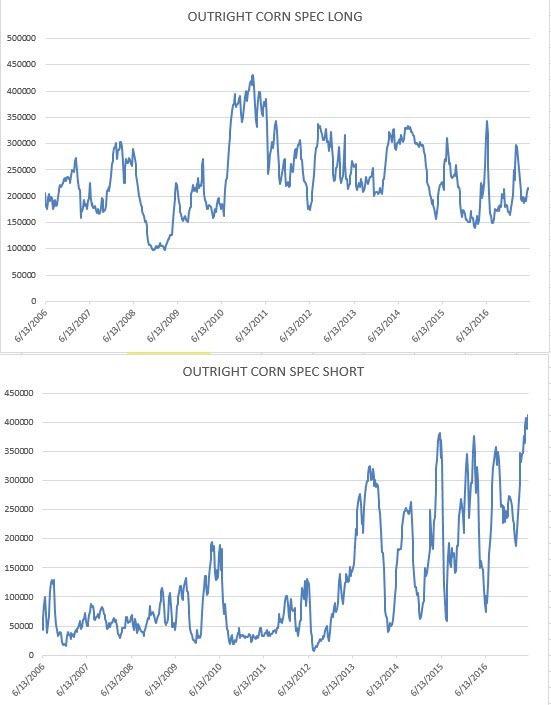 Outright spec shorts are above 400 k for the second time ever, while outright longs are near three month highs and not far from where they stood when prices topped out in February. The difference between now and in Feb is the short position, then it was 1/2 of what it is now. I think the markets are going to begin to get volatile very soon. This sideways slumber we have been in since the first of the year has the trade very lazy right now. A wake up call is coming in my opinion. I could make a case for it going either direction. Producers might want to look at something like a 370-430 August Short Dated Corn LONG straddle for 10 cents out of pocket. If the market trades sideways for the next month, the most you can lose is 10 cents before fees. If it breaks higher or lower substantially, you can take the position in that direction. 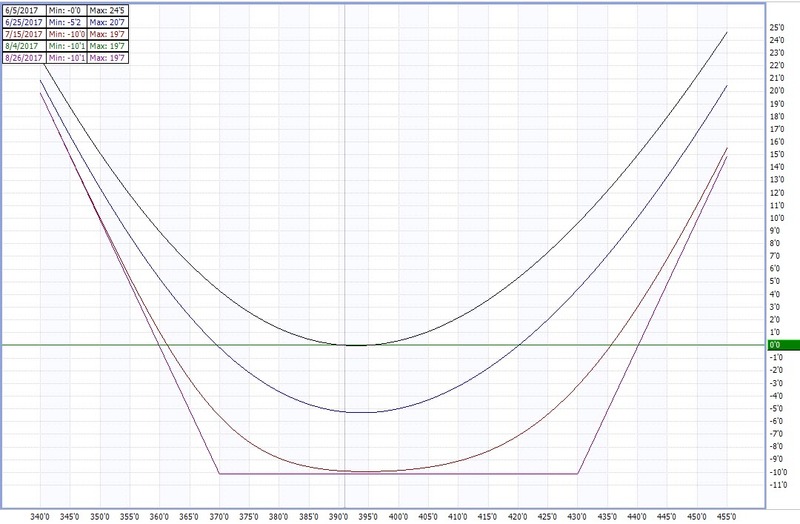 Above is Optionsource P/L graph of the example I mentioned. Call if you have any questions. Lastly, if you read Agweb or watch US farm report you will see me on a number of pieces this week. Thanks to Tyne and Clinton for having, I always enjoy being in South Bend with them. Click on the image to see this weeks US Farm report.